Posting on Google+ is quite easy, and you can post text, links, photos, videos, and even your current location. However, you need to become familiar with a few things that are a bit different from social networks like Facebook and Twitter. Text: Just start typing. That’s it! If you include a link in your text, Google+ should automatically detect it as a link, and if your link points to a video, Google+ will automatically attach a video. To boldface a word, place an asterisk (*) on both sides of it, *like this*. To italicize, surround your text with underscores (_), _like this_. To strikethrough, surround your text with hyphens (-), -like this-. 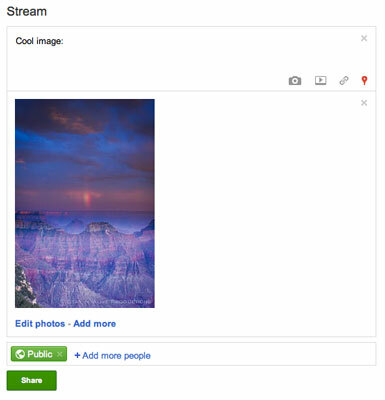 Graphics: You can easily upload images from your hard drive to include in your Google+ posts. You can include static images, and Google+ supports animated gifs as well. To share an image, click the image icon in the post box. You can then choose to upload a new image, or if you’re on a phone, upload from your phone’s camera. Videos: You can either upload your own video or link to a YouTube video and it will be embedded right alongside your text. Google owns YouTube, so the integration is seamless. Just click the video icon and then choose whether to upload from your computer or phone or link through YouTube. Links: You can either type or paste a link into the Share What’s New box or click the link icon and insert your link there. Google+ will pull in explanatory text from the link’s target page. 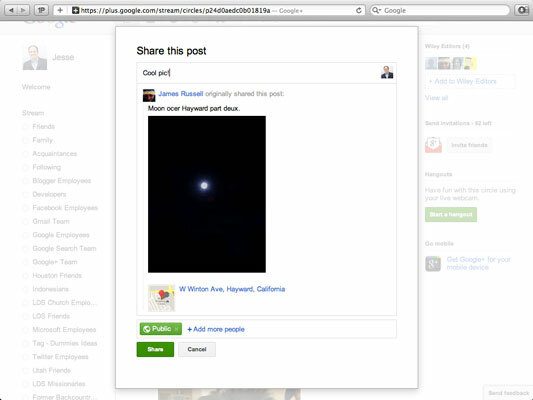 Google+ will also pull in thumbnails of images from the page your link targets. Before you click Share, use the left and right arrows above the image to choose which graphic you want to include in your post, or click the X to remove the image altogether. Share your location: If your browser supports it, you can also attach the location of where you are posting alongside the status update you shared. If you include the location with your update, a little map will be attached to your post, showing where you are.